If you are interested in learning what past customers have felt about our technical services and team of Electricians, read the comments below. At J.G. ELECTRIC COMPANY, INC., in Wayland, Massachusetts, we take pleasure in reading any comments our clients send us. "We love working with JG! Jay is extremely knowledgeable and we rely on his expertise. The team's work is always done with professionalism, and they are very accommodating." "JG Electric has proven to be a reliable go-to contractor. They continually deliver quality and timely work on all size projects. We rely on their expertise and knowledge on all manner of electrical needs, from installation and repairs to preventative maintenance and testing." "I have known and used JG Electric as a subcontractor for many years. They have always offered competitive pricing. JG Electric's employees are hardworking, professional, and courteous. They are great to have as part of the construction team!" —Dave M., DMAR Construction Co.
"As a busy professional, I depend on JG Electric to service my home's electrical repairs. They do this in a timely and professional manner." "I've had the opportunity to work with JG Electric since 1980, and Jay and his team have consistently given quality work and great customer service. They always go the extra distance, and this has been especially important when emergencies arise. 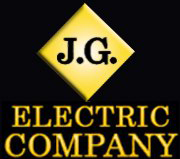 I would not hesitate to recommend JG Electric for all of your electrical needs."